A delicious pot of pintos with chipotle and other good stuff, including (of course) bacon. Cold weather sends me straight to the kitchen, every time. This afternoon, as the temps dipped into the teens, I whipped up some bacon-potato cakes from “The Feed Zone Cookbook.” This evening it was a big pot of pintos with chipotle from “The Santa Fe School of Cooking Cookbook.” Herself contributed a large, cast-iron skillet full of cornbread and a green salad. Meanwhile, a couple Ziplocs of frozen Anaheim and New Mexico chiles are thawing in the fridge, and we may just have to have some bean-and-potato burritos smothered in green chile tomorrow. That should help keep the hawk out there in the wind where he belongs. This entry was posted on November 21, 2013 at 6:31 pm and is filed under Cooking, Fall, Snow. You can follow any responses to this entry through the RSS 2.0 feed. You can leave a response, or trackback from your own site. Threw together a white bean chicken crockpot chili this a.m. Washing it down with a 5 Barrel and the usual sidekicks, Sister Guac and the Dancing Salsas. That sounds good … did you use white meat or dark? I’ve been going dark on anything even vaguely stew-like. 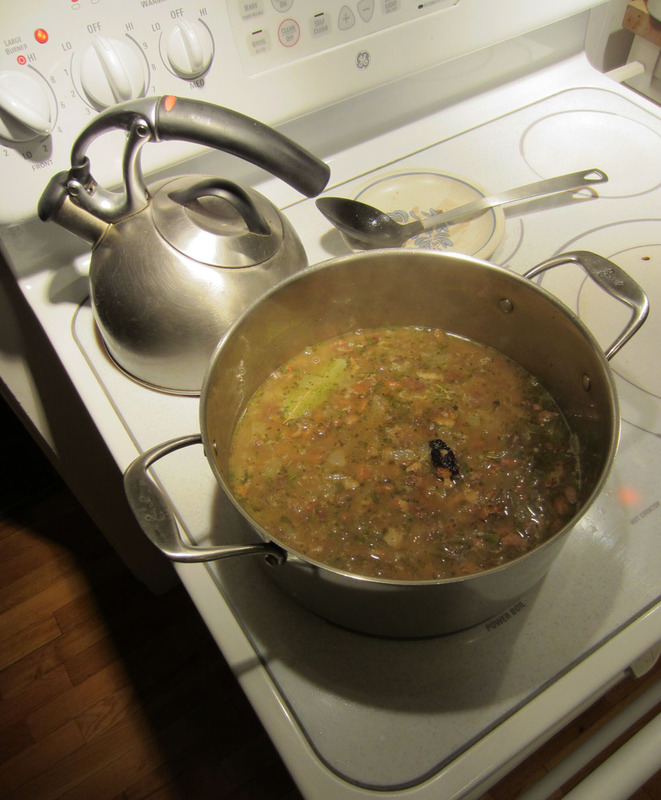 I seem to recall doing a chicken-thigh posole a while back … might have to dig up that recipe. This is Sandy. I LOVE it when men swap recipes! And I absolutely love pintos and cornbread!! What time should I be there?